This is one of my favourite dresses at the moment and I considered it a bargain when I purchased it in a recent sale at Forever New. When I look back on my outfit pictures over the summer, it is very obvious that Forever New has been my favourite store recently. At the moment, most of my outfits incorporate a piece from this shop. It seems to have replaced my Modcloth addiction (since I decided to take a break from online shopping given the high shipping costs). I love this new bag that I received as a gift the other week. I saw it with my mother in law a couple of weeks ago in David Jones and she bought it and said that I could have it! I like it because it reminds me of a bowling ball and I absolutely adore tenpin bowling. Rydog says it reminds him of a poker ball. 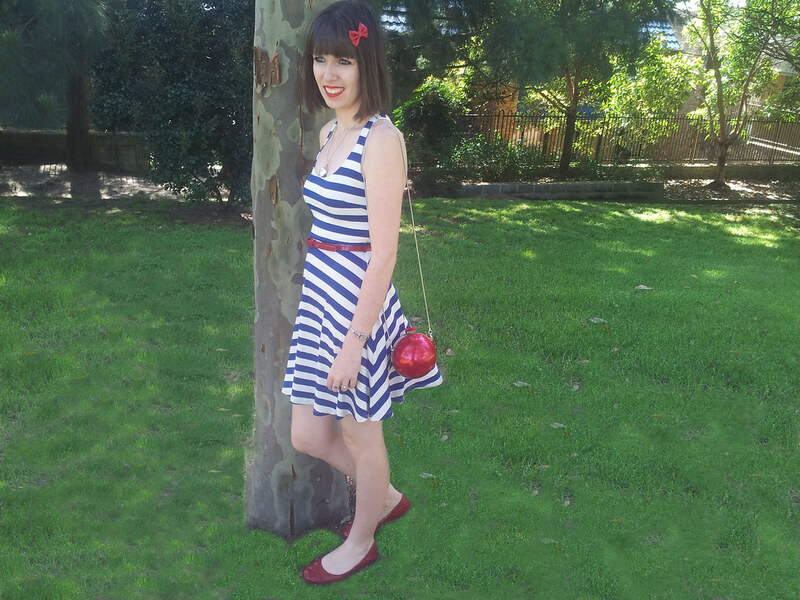 Red, white and blue is one of my preferred colour combinations to wear so I enjoyed combining many of my red accessories to form this outfit. I wore this outfit on Saturday. This weekend was one of the most enjoyable I’ve had for a long time. I went to the Taylor Swift concert, tenpin bowling and shopping and spent lots of time with family. 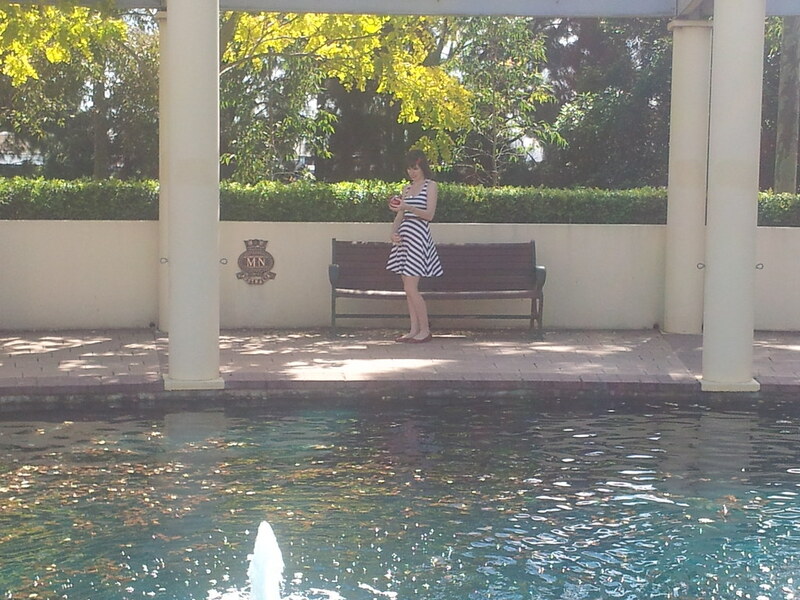 (Just as well I had a good weekend, it was my last weekend of being 22!). 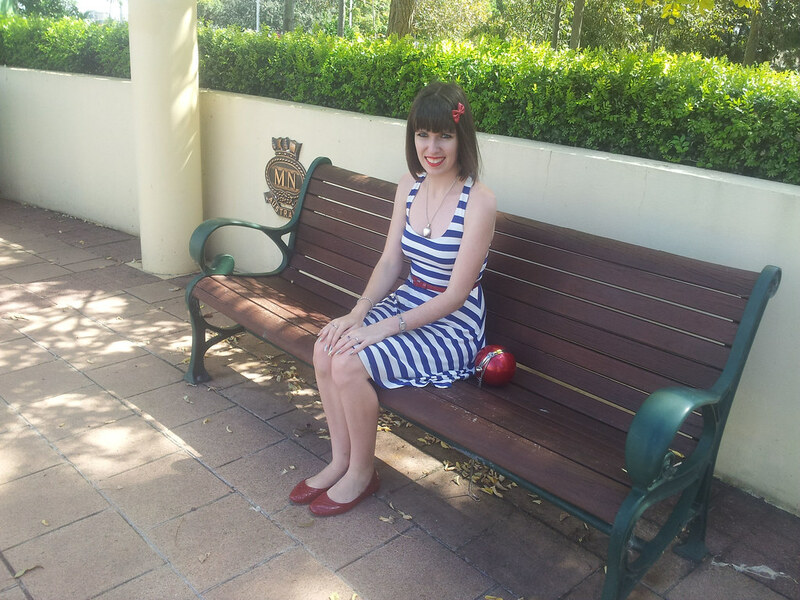 Last Thursday, while at the shops, a little girl and her mother told me that I looked like Snow White. I was wearing this outfit, with a few modifications. I guess it must have been the red lipstick, pale skin and dark hair. I was really surprised at first but the more I think about it, the more I like it. I’ll definitely take that one as a compliment. It’s made me feel good for the last few days. This entry was posted in Forever New, Outfits, Steve Madden, Thurley, Uncategorized. Bookmark the permalink. This striped dress looks great on you and the red details are so cool! You look super fabulous!! I lovelovelove the nautical look. Red, white, and blue is such a classic color combination. I love your red shoes! You are sooooooooo lovely, my dear friend. Loving your bag. Really love this dress! It's so pretty. Red, white and blue are a great combination together. The dress is gorgeous and I love the red accesories with this outfit. Ah! This dress is gorgeous!! I love red white and blue as well. This dress is soooo pretty and it looks amazing on you! And hey, we both have red bows in our hair in our most current blog posts! How was Taylor Swift live? I've seen her on TV live a bunch of times and she's pretty hit or miss. But I like her! Cute! How adorable is that bag?! your hair cut, skin tone, and red lips are very snow white – esque – that't actually a huge compliment because she was saying you look like a princess! that's cute. little girls just point at me when i wear dresses in the winter and say 'mommy she has no pants.' haha. 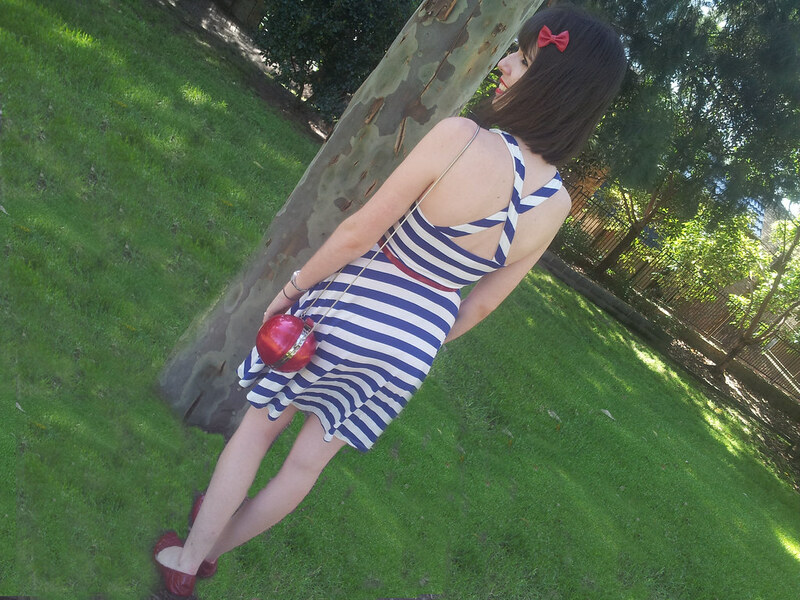 i love this dress – skater dresses like this are my favorite and i love stripes! the blue and red are great together – i love that awesome bag you have. 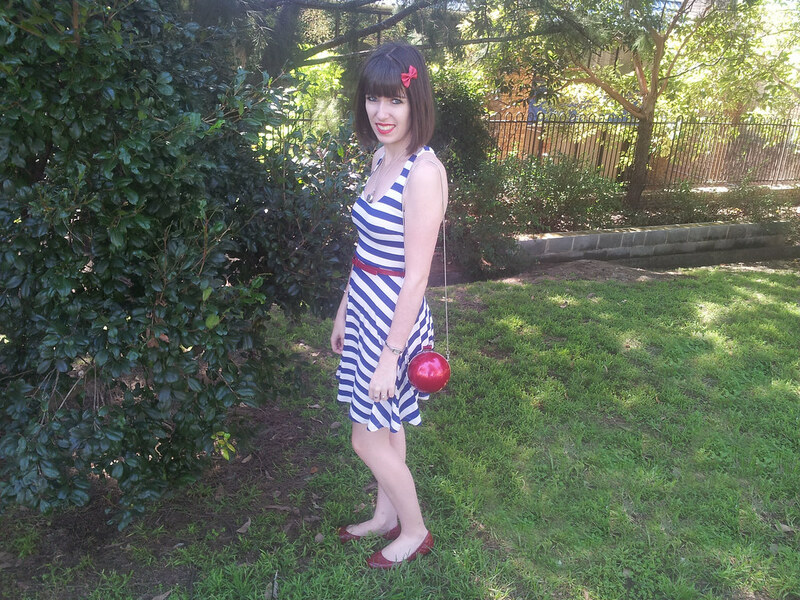 Such a cute outfit, I love the stripes and the pop of red. What a cute look! Thanks for the comment! This dress is so great on you. I love the cut of the back! And how cute is that purse?! Your little hair bow is too cute! What a darling dress! Love the cross strap back! You DO look like Snow White!! I definitely agree you are the fairest of them all. You're so pretty. 🙂 You've always reminded me of Audrey Hepburn in the last three years, but you also give off a very modern fairytale vibe. There is something so naturally lovely about you and combined with your whimsical style, it is so magical. Gorgeous! 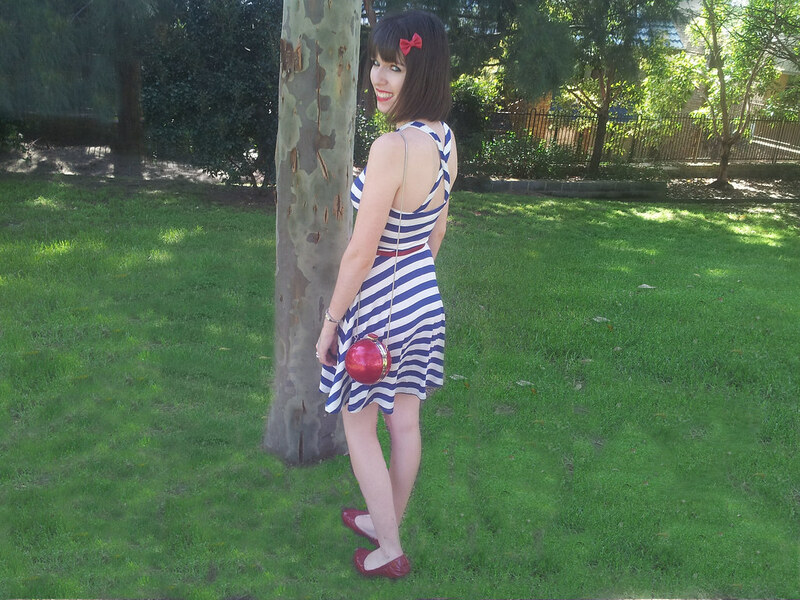 From cute hairclip to red flats and lovely bag, I've got my eye on your blog now. 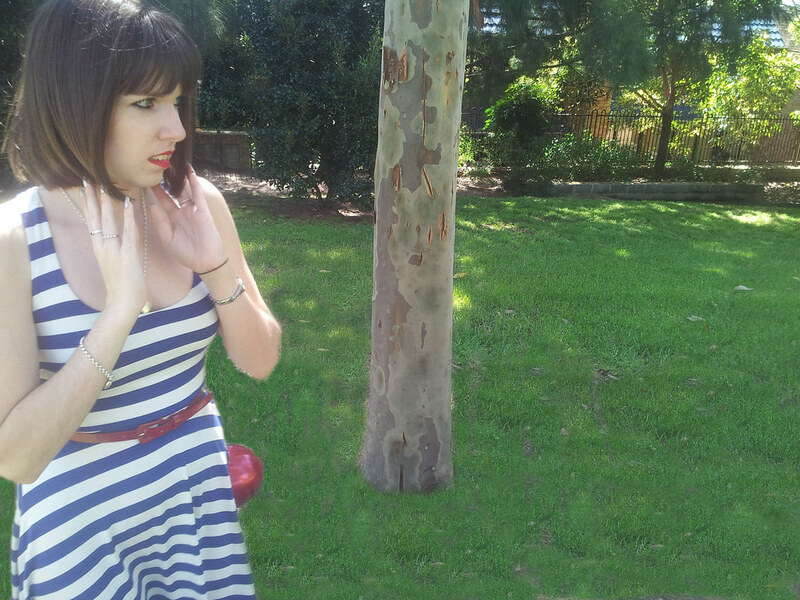 You look gorgeous in your striped dress! I really like the back detailing on it. The red lipstick and shoes are so cute too. Happy birthday! That's such a fun outfit. This is the cutest outfit, and I'm in love with that bag!! !